viaLibri ~ A Domestic Animal. London: Longmans, Green and Co.,, 1969. Octavo. Original orange boards, titles to spine gilt. With the dust jacket. Spine slightly rolled, small mark to foot of rear board; an excellent copy in the bright jacket. First edition, first printing, the so-called "suppressed" edition. This edition was withdrawn before publication, rewritten, and reissued in 1970, as a result of a libel case involving the former Labour MP, and King's erstwhile friend, Tom Skeffington-Lodge. With a TLS from the author to Tom Driberg, journalist and MP, sending him the book and flippantly mentioning the libel action threatened by Skeffington-Lodge, who is referred to here as T.C. Radcliffe-Hall. He laments the unpleasantness but admits, "I suppose it was naughty of me." King had put into the book a scene based on Skeffington-Lodge's bid for a peerage. After writing to senior figures in the Labour Party, urging them to intercede on his behalf, Skeffington-Lodge received a one-line reply from Lord Attlee, expressing the hope that he would "get what he deserved"; Skeffington-Lodge took this at face value and read it aloud at a dinner party at which King was present. 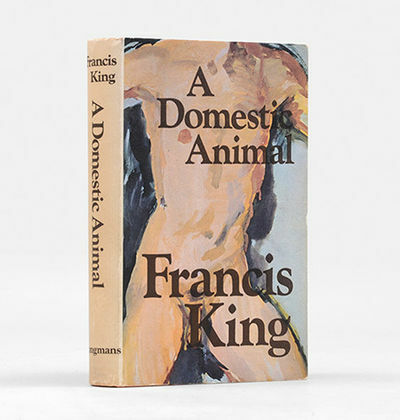 King then put this verbatim into A Domestic Animal, taking the precaution of disguising his original source as a female character named Dame Winifred Harcourt. Also present is a subsequent signed note from King imploring Driberg and other owners of advance copies to destroy them "without fail or return to me for destruction". The request has an unrelated but entertaining jotting by Driberg on the back.